There are over 150 questions in this app which are multiple choice. Multiple choice questions correlate with all standardized testing. 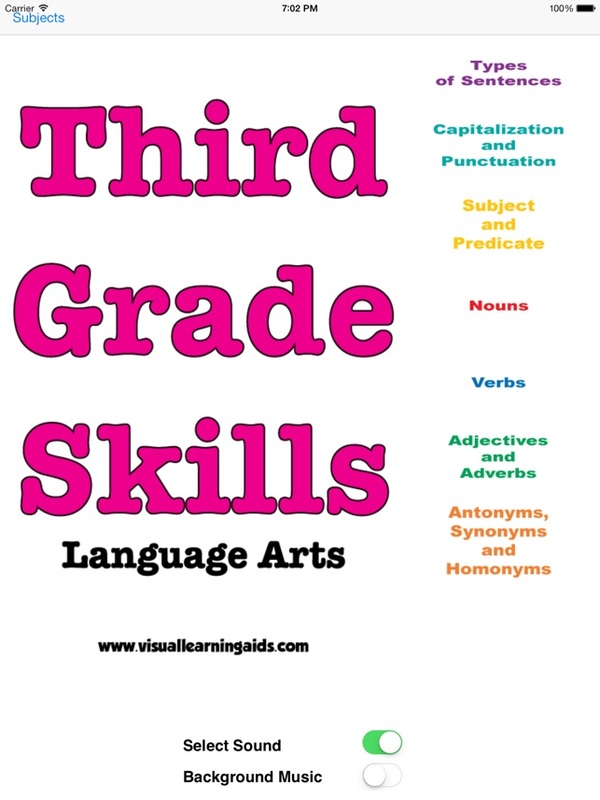 This visual aid will help third grade students master Language Arts in the classroom and on standardized testing. 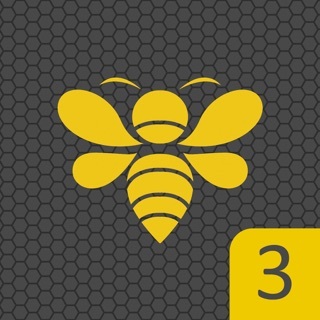 This app includes graphics in each section of the app. 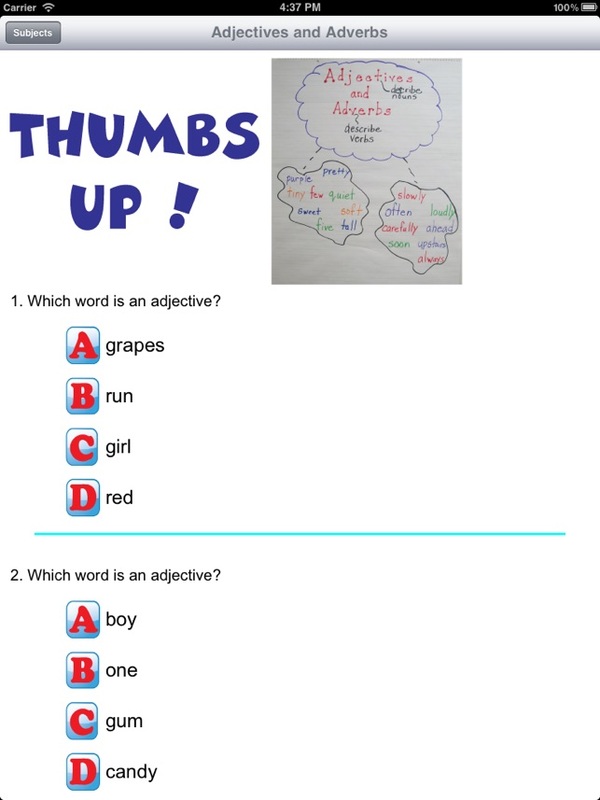 The graphics will help aid students in understanding language arts. There are 7 sections in this app. 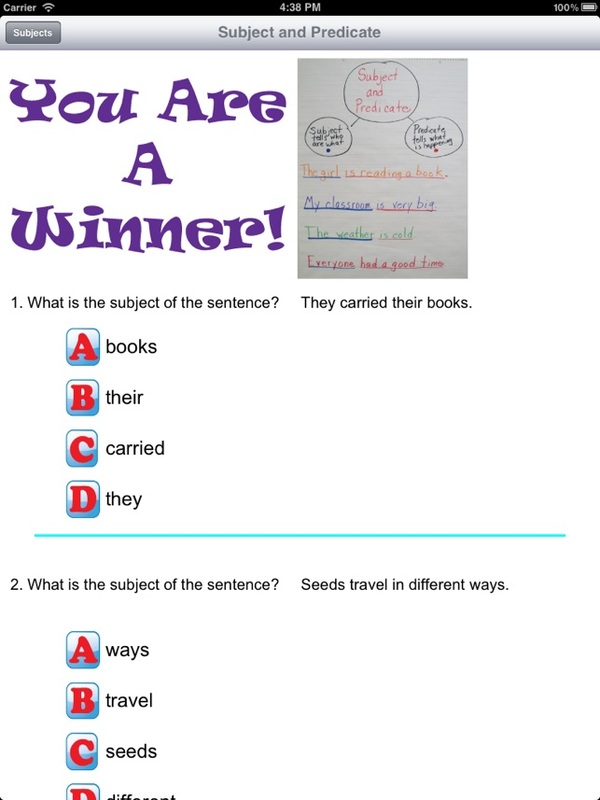 The sections are: Types of Sentences, Capitalization and Punctuation, Subjects and Predicates, Nouns, Verbs, Adjectives, Adverbs, Antonyms, Synonyms, and Homonyms. 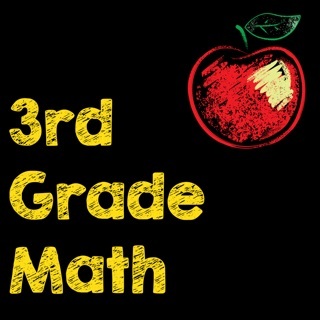 Third grade students will be confident in their Language Arts class and will achieve success on standardized testing. 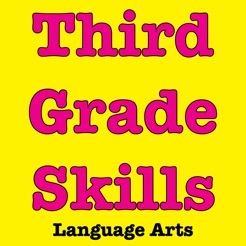 This app is aligned to the third grade curriculum. I like the multiple choice tests but the App has some flaws. 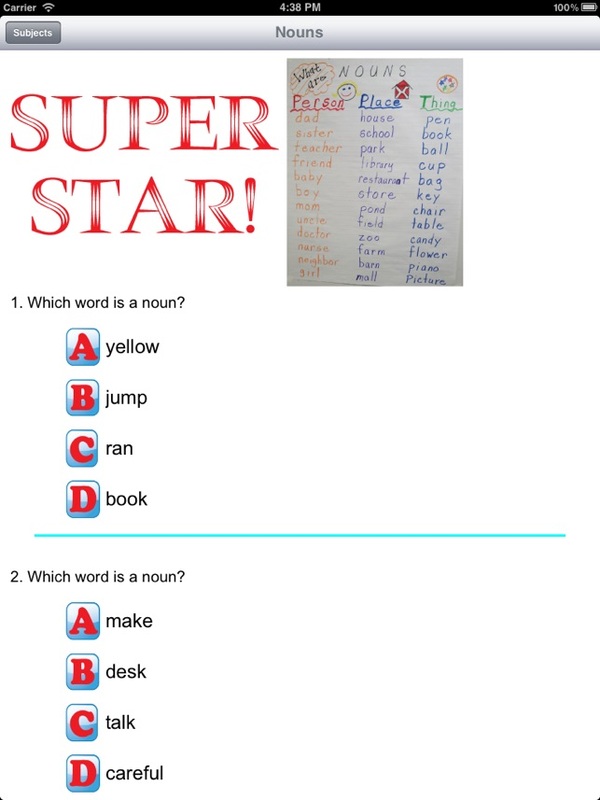 First, my son took the verb test and when he chose "ran" as an answer the App said it was incorrect. The App said "funny" was the correct answer. As far as I know, "ran" is a verb and "funny" is an adjective. 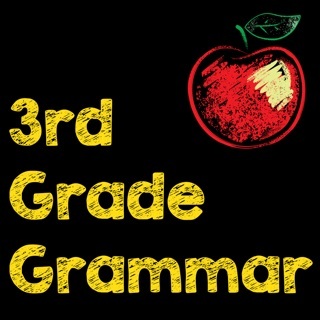 Disappointed because the App has a lot of potential, but I am now afraid to let my son use it because he might be taught incorrect grammar. Basically, this is a bunch of static worksheets. My 7yr old, who is entering 3rd grade in Sept, finished the entire app in half an hour. There were several errors (eg questions that could have multiple correct answers as well as ones that were plain wrong). The questions themselves were pretty good but the fact that they don't change limits this app tremendously. Very disappointing. Suggestions: add more questions; increase variability of questions; add more difficulty by mixing up questions; add more punctuation related questions. This app is wonderful, it reinforces what is happening in the class room. This has been very helpful to my daughter who just needed a little more help. Worth 10 times the price, our grades are up and I have a confident child.